Riding on the heels of the historic Asian Cup 2019 qualification the Philippine Men’s National Team, more popularly known as The Azkals, the Philippines is set as the perfect venue for the upcoming “The Business of Football - Philippines” one-day Conference. The event is organized by MMC Sportz Asia, best known for delivering the high-caliber annual SPIA Asia - Asia’s Sports Industry Awards & Conference (www.spiaasia.com), recognizing and celebrating Asia’s top achievers within the sports industry. “The Business of Football – Philippines,” sanctioned by the Philippine Football Federation (PFF), is the first of its kind to take place in the country on 18 May 2018, from 10am to 5pm at the New World Hotel Makati. The one-day Summit will bring together all the key stakeholders of the football community in the Philippines from the rights holders, football clubs, agencies, brands, media, retail, real estate, and of course, the fans. The overall objective is to educate and to discuss the current state of football in the Philippines, with the goal of being able to determine the strategy to make it the biggest spectator sport in the country. “There is so much un-tapped potential in the football-business in the Philippines, that we felt like it is time to bring all the key stakeholders together in one room, and to discuss the state of the game, and how we can develop the sport in the Philippines,” states Eric M. Gottschalk, CEO of MMC Sportz Asia Inc., the organizer of the conference. Philippine Azkals Team Manager Dan Palami says, "The Business of Football - Philippines, is timely, since it gathers all the relevant stakeholders in Philippine football in one venue. It is high time we get our act together, and elevate the level of the sport, in time for the upcoming Asian Cup 2019. Wherein the country, and the Philippine Azkals will have the opportunity to make a mark, and create history in the international football scene." The conference will cover topics such as Football in South East Asia, State of Football in the Philippines, Why Brands Should Get Involved, Developing Football in Asia, Asian Cup 2019, Youth Academies, among others. The event will also feature a Job Fair, wherein participants can explore careers in football, learn from industry leaders, and get to network with key executives in the industry. 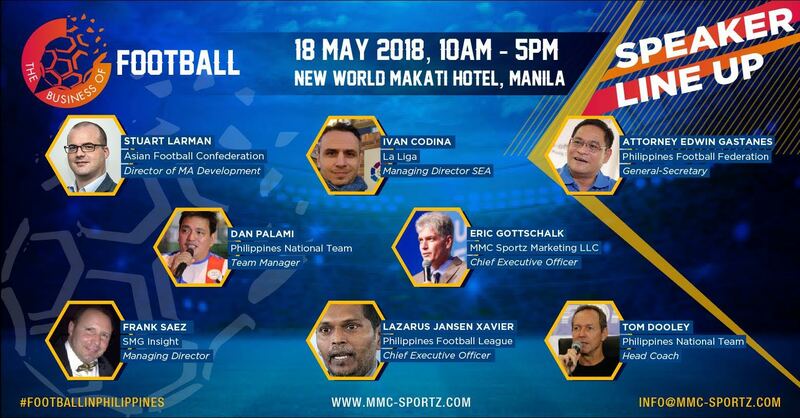 Confirmed speakers include AFC Director Member Association Development Mr. Stuart Larman, La Liga Managing Director for SEA, Mr. Ivan Codina, Men’s National Team Manager Mr. Dan Palami, Men’s National Team Head Coach Mr. Thomas Dooley, Philippines Football League CEO Mr. Lazarus Jansen Xavier, MMC Sportz Marketing CEO Mr. Eric M. Gottschalk, SMG Insight Managing Director Mr. Frank Saez, and PFF General Secretary Atty. Edwin Gastanes, among many others. Organized by MMC Sportz Asia, the event is sanctioned by the Asia Football Confederation (AFC) and the Philippines Football Federation (PFF) and sponsored by La Liga, Dentsu, SMG Insight, RSportz and Platinumlist. Delegate passes are available online at Platinumlist (The Business of Football - Philippines) and priced at P2,750 for regular delegates and P1,500 for the student pass.